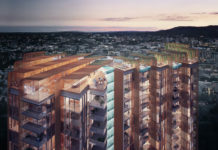 Architecture firm Plus Architecture and international student accommodation provider Scape Student Living have partnered up to deliver three new student accommodation projects in Brisbane, equating to more than 2000 purpose built student accommodation (PBSA) beds to the city. 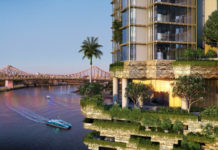 But the partnership’s most noteworthy trait is the unique external facade designs proposed on their Brisbane projects. 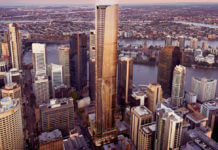 The first of these projects, Scape South Bank (designed by Denton Corker Marshall and documented by Plus Architecture) topped out this week, with early works beginning on two further projects – Coronation Drive, Toowong and Tribune Street, South Bank. Plus Architecture Director Danny Juric explains how the unique lattice screen facade of Scape Tribune Street is reminiscent of the traditional Queenslander sleepout/veranda which provides light and shade to bedrooms. 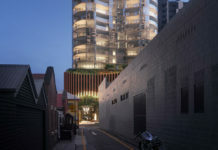 The dynamic screen is a translucent perforated mesh that will light up at night to act as a lantern and provide a focal point for the precinct at the end of the adjacent Tafe laneway. Scape’s newest student accommodation development at Toowong. “Carved into the building from level 7 to 13, this space directly represents an understanding of the suburb, stepping from ‘river to hill’. Treated as a hill town at a micro scale the terrace is planned for large social gatherings in ‘public squares’ as well as individual study in small scale ‘garden’ refuges,” Danny Juric said. Indigenous sub-tropical planting has been selected to heighten a sense of place, interspersed with edible planting and herbs for use in the student kitchens. Both the South Bank and Toowong projects are built from the ground up to facilitate and build community, with dedicated shared spaces that blend with individual and low volume areas to allow residents comfortable interaction in both large and small group settings, as well as privacy. Matched with Scape’s dedicated 24-hour concierge and year-round activity and event program, residents are drawn out of their individual spaces and encouraged to interact with each other and with the wider city. In both Coronation Drive and Tribune Street projects community is vertically integrated, and both projects are located to provide unparalleled access to the city and thriving surrounding precincts – not just universities. “Rather than segment communal areas by floor, creating stratified shared space based on what floor you inhabit, our focus was on creating tower-wide communities,” said Hartnell. A key part of this revolved around the design of external spaces. Coronation Drive features a unique 7-storey external terrace. Both Plus and Scape dismissed fears of a glut in Brisbane student accommodation. “In all markets in Australia as purpose built student accommodation (PBSA) developments come to market there will be digestion issues as students transition from homestay and low quality residential property offerings,” said Managing Director of Scape Australia, Stephen Gaitanos. These student accommodation units are going to be the slums of the future very small cramped designs. When they can’t fill them with students who is going to live there. Is the Hilton going to turn into a slum? The same could be said for any hotel in any city of the world. Brisbane is a growing city and our universities are some of the best in the world. We have more students coming to Brisbane every year to take advantage of our highly ranked education system and an international provider like Scape is exactly what is needed to support these students now and in the future. So who’s going to pay for the infrastructure required in Toowong to accommodate 500 already being built, plus the three towers where Coles is currently, plus the three flute towers on the old ABC site, plus the new Student accommodation in Brisbane Street near Coles … ??? Thanks Councillor Simmonds … hope your getting lots of donations (from whoever) for you to run for the federal seat of Ryan … wink wink say no more … ha ha ha. Students are apparently earning a lot of money these days…. Jane – inclined to agree about inadequate infrastructure planning – however, who is going to pay? Developments of this scale would attract around $2mill in council infrastructure charges. So the answer usually is the developers. The BCC has halved infrastructure costs for student accomodation so in this case it will be the taxpayers and ratepayers paying for the infrastructure. I had these concerns to as have witnessed a lot of slum type dwellings off the back of as huge development – Sydney 2000 – Homebush is an exquisite example! A quick look at the Scape living site suggests they have internal advantages for those who live in their apartments and are are aware of offerings beyond the students tenancy. It’s mostly Chinese and some Indian money, yes there is a lot of it and be very grateful it’s coming here to Brisbane and not elsewhere.